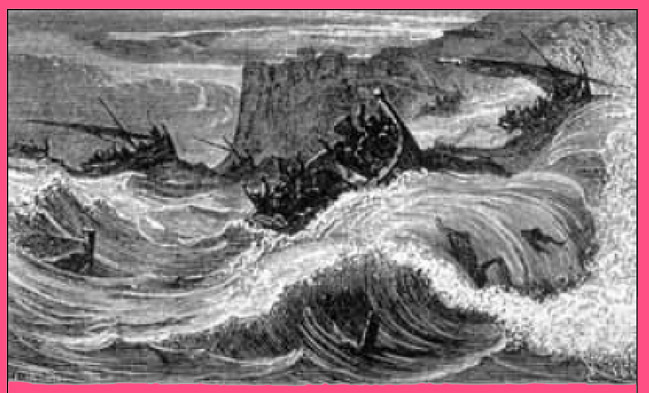 In 1833 a great earthquake off the coast of Central Sumatra in Indonesia generated a destructive tsunami that must have affected Sumatra and the entire Indian Ocean basin and western coast of Australia. Magnitude - The Moment Magnitude of the 1833 earthquake has been estimated to have been in the order of Mw= 8.7 to Mw= 8.8. However, based on field studies of coral growth rings in the region (Zachariasen et al. ), it was postulated that the moment magnitude may have been as great as Mw=9.2 - almost as much as that of the Great Earthquake of December 26, 2004 (Mw=9.3) and much greater than the 1861 earthquake ( for which estimates range from Mw= 8.3 to Mw=8.5). Active subduction of the Indian and Australian oceanic plates beneath the Sunda Plate - which is part of the Eurasian plate - has shaped the young (40 million years) Sunda Arc and Trench system along its entire length. All segments of the great subduction zone off Sumatra have been extremely active and have produced numerous major and great earthquakes in recorded history from as early as 1797, 1833 and 1861 and as recently as 2004, 2005 and 2007 (Newcomb et al. 1987; Pararas-Carayannis 2005a,b and 2007). The earthquake of 1833 occurred along the active Central/Souhern Sumatra segment of the Sunda Subduction Zone (SSZ), (known as the Mentawai Fault) where the Australian plate subducts beneath the Burma microplate. The subduction rate in the Mentawai Segment of this system is about 60 mm per year.The earliest known great earthquake along this segment occurred in 1797. The latest great earthquake (Mw=8.4) on this same segment occurred on September 12, 2007 (Pararas-Carayannis, 2007). Actually, three other major earthquakes occurred in the same segment shortly after the great 2007 earthquake. Vertical Deformations Caused by the 1833 Earthquake - Comparison with the Earthquake of 1797. The vertical deformations caused by the 1833 and the 1797 earthquakes in the outer-arc islands off Central/Southern Sumatra were determined by extensive field studies which correlated patterns of uplift and U-Th dating of coral microatolls (Zachariasen et al., 1999). Based on patterns of deformation and on constrain models of slip on the subduction interface, detailled maps of uplift were prepared for these earthquakes. Accordingly, Sipora, North Pagai and South Pagai Islands, which span a distance of about 160-km in length along the outer-arc ridge of the tectonic boundary, have corals that display evidence of uplift associated with the 1797 earthquake. This uplift ranges from zero to 70 cm, and has a distinct northeastward tilt, away from the trench. Also, these islands have coral growth rings that recorded the vertical deformations associated with the 1833 earthquake. The uplift values for this earthquake range from 1 meter up to 2.30 meters. The corals that were studied show a pronounced tilt away from the trench as with the 1797 event. However, no evidence of uplift or submergence was found from either the 1797 or the 1833 earthquakes on neighboring Siberut Island, farther northwest (Zachariasen et al., 1999). Slips, Orientation and Estimated Moment Magnitudes of the 1833 and 1797 Earthquakes. On the basis of the above described field measurements (Zachariasen et al., 1999) it was concluded that the 1797 earthquake had slips of about 3 meters and the 1833 earthquake had slips of about 12 meters. Also, the dips associated with these earthquakes were estimated to be about 12° in a northeastward direction at about 25 km below the outer-arc islands. Based on deformations, slip estimates and extend of ruptures the Moment Magnitude of the 1797 event was estimated at about 8.4 while that of the 1833 was estimated at about 8.7. For both events, rupture beneath all three of the outer-arc islands (Sipora, North Pagai and South Pagai) was required to produce the uplift that was observed. The northwestern limit of both 1797 and 1833 ruptures must be no more than 40 km northwest of Sipora (the northernmost of the three islands). The southeastern limit of the 1797 rupture is well constrained to beneath the southern part of South Pagai (the southernmost of the three). The southeastern limit of the 1833 rupture is poorly constrained, but extended well beyond South Pagai Island. The downdip limit of rupture in 1833 is appreciably deeper (farther northeast) than that of the 1797 event. The adjacent map shows the estimated dimensions of the tsunami generating source areas off the coast of the island of Sumatra associated with the earthquakes of 1833, 1861, 2004, 2005 and 2007. The giant 1797 and 1833 earthquakes involved rupture of the same patch of the subduction interface beneath the islands, but slip extended farther downdip and southeast in 1833. Slip on the patch beneath the islands was also several times larger in the latter event, far more than could have accumulated in the 36 years between events. Thus it appears that slip magnitudes can vary by a factor of four or so on the same fault patch and that not all accumulated strain need be relieved in a giant earthquake. Paleoseismic evidence indicates that over the past millennium, the islands have risen during giant earthquakes or earthquake couplets about every 230 years. At least three of the episodes appear to have been couplets separated by just a few decades. There is not much data on the effects of the 1833 tsunami in Sumatra, Australia, Sri Lanka, India, the Maldives or on any of the islands or countries bordering the Indian Ocean. Undoubtedly the tsunami must have been devastating on the adjacent coastline of Sumatra. However, because of the orientation of the generating area, most of the tsunami energy radiated primarily towards unpopulated coastal areas of the Southwest Indian Ocean. The tsunami must have had an impact on Sri Lanka, the Maldives, Madagascar and other islands and coastlines of Africa. Not much of its energy radiated towards the Bay of Bengal, so India - with the exception perhaps of the Tamil Nadu State - was not greatly affected nor was the coastlines of Bangladesh, Burma or Thailand. Also because of the tsunami's source area orientation, western Australia was not impacted in any significant way. The rupture of the 1833 earthquake is estimated to have been between 300 to 350 km. It was considerably less than the 1,200 km rupture of the December 26, 2004. 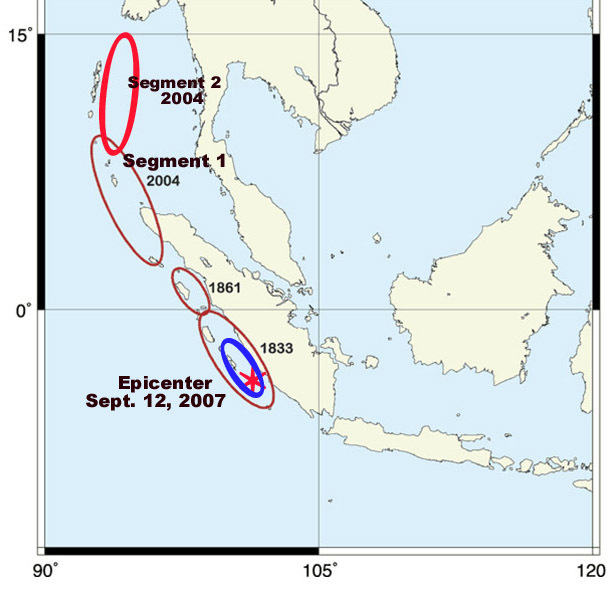 Although the magnitude of the 1833 earthquake was great, the tsunami generating area was much smaller than that of 2004 - the latter extending along two segments of the great Sunda tectonic boundary in northern Sumatra and the Andaman Sea. Engraving of the 1833 Tsunami (by Edouard Riou, 1833-1900; National Information Service for Earthquake Engineering, University of California, Berkeley). Newcomb KR & McCann WR. 1987. Seismic history and seismotectonics of the Sunda Arc. Journal of Geophysical Research; 92:421-439. Sumatran subduction earthquake: Evidence from coral micro-atolls. Journal of Geophysical Research; 104:895-919. Nott J & Bryant E. Extreme marine inundations (Tsunamis?) of coastal Western Australia. Geology Journal; 11:691-706.